Permit me the honor of extending to you all the support, empathy, and encouragement I can muster as you cope with the aftermath of the cowardly, barbaric bombing attacks of July 7th. My thoughts and prayers have been with you since I heard the news. Britain and the United States once again find themselves with a commonality, a shared experience that draws us close to one another. We owe the very existence of our beloved country to brave settlers of English stock. we share a common language, a common ancestry, and a common cause: the cause of Freedom. While we purchased our independence from you in blood, we have re-established a bond of friendship and kinship in the same blood. Time and again, our two countries have proven each others' staunchest allies. And just as you stood by us in the dark days following 9/11, so we will stand by you now. Watching the news coverage, I was deeply moved. And while I was moved to sorrow and anger and disgust at the savagery visdited upon you, I was most deeply moved, and stirred, by your response. It was the response of a Britain that I hoped, and believed, still existed. I was inspired by the defiance, the resolve, the courage you displayed. It speaks to your character as a culture that you fight the hardest, stand the straightest, and endure the bravest when your backs are against the wall. When I think of Britain in times like this, I think of one phrase: Bloodied but unbowed. Your ancestors who stood up to the Armada, or to the Luftwaffe, would have recognized themselves in you yesterday. Upon this battle depends the survival of Christian civilization. upon it depends our own British life and the long continuity of our institutions and our Empire. The whole fury and might of the enemy must very soon be turned on us now. [Al Quaeda] knows that it will have to break us in this island or lose the war. If we can stand up to them, all Europe may be free and the life of the world may move forward into broad, sunlit uplands. But if we fail, then the whole world, including the United States, including all that we have known and cared for, will sink into the abyss of a new Dark Age, made more sinister, and perhaps more protracted, by the lights of perverted [religion]. 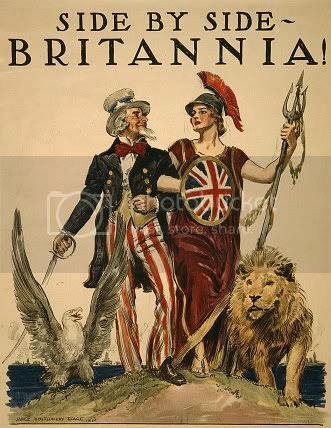 Let us therefore brace ourselves to our duties, and so bear ourselves that, if the British Empire and its Commonwealth last for a thousand years, men will say, "This was their finest hour." As my more regular readers know, I've stayed away from the grill for a couple of weeks. But this past weekend, I was ready to get back into the game. I picked up a roughly 2-lb. piece of buffalo (American Bison) tri-tip from our local butcher the other day, and desperate for a new recipe, I came up with the following. In my mind, it wasn’t much of a recipe, but The Feared Redhead insisted I post it. It requires the use of a grill outside, AND a stove inside (or you can put the skillet on the grill). buffalo tri-tip roast, 2 lbs. Apply dry rub to steak. One of these days, when I’ve codified it, I’ll provide my own rub recipe, but for now, any good grilling rub intended for beef will do. Place the meat on a grill heated to medium to high heat, turning every 5 minutes, until a meat thermometer inserted into the thickest part of the meat registers the desired temperature. I prefer roughly 150 degrees F, or medium rare. Buffalo is a tricky meat to cook. If done right, it’s tenderer than beef, but it’s also leaner, which means it’s easier to overcook. For steaks, 3-6 minutes a side is ideal. But when cooking meat of roast thickness, things get dicier. It’s possible to dry out the outer layer of meat before the inside is at the proper temperature. To prevent this, baste the roast with beer after each turn. When the meat is at the correct temperature, remove from the heat and let it rest. Slice your bread into sandwich-sized lengths, then slice these down the middle. Rub each open side with olive oil, place on the grill for roughly 3 to 5 minutes, or until toasted. Once the meat has rested for about 10-15 minutes, slice thinly across the grain. At this time, slice the tomatoes into round slices, about ¼ inch thick. Rinse the lettuce and break leaves off at the base. Do NOT cut the lettuce. Slice your onion thinly. Crimini mushrooms (actually small versions of the portabella mushroom) should be sliced thicker, about ¼ inch in thickness. In a medium-sized skillet, heat the butter until it melts and begins to sizzle, but do not brown. Add your onion slices, sauté until clear. Add the mushrooms, continue to cook until the mushrooms begin to brown, add blue cheese. Continue to cook until the blue cheese begins to melt, remove from heat. Place several slices of buffalo onto the bottom halves of the bread. Spoon on the mushrooms, onions, and cheese. Plate open-faced, place the lettuce and tomato slices on the second half of each sandwich. Serve with Gourmet kettle-cooked potato chips, Salt and Vinegar is an excellent choice of flavor. Oh, and if you happen to have an extra bottle of the beer you used to baste the meat, well, that's not so unlucky either. Sorry for the lack of posts the last couple of days, folks, I've been fighting a nasty virus. Should be back up to speed by Monday.